R.J. Marra likes to say he was born with a catalog in his hand. It’s not that far from the truth. Marra’s father owns a NAPA store in New Canaan, Connecticut, and Marra recalls tagging along with his dad on Saturday mornings when he was 4 or 5 years old. “I always love telling people that my earliest memories here are reaching up to put a part on the bottom shelf,” Marra says. Marra started working part-time at his dad’s store when he was in high school. Now 26, Marra celebrated his 10th anniversary at the store in December. Marra’s father, Rich Marra Sr., taught him that “any job worth doing is worth doing right.” Clearly, the message hit home. R.J. Marra has completed more than 500 training courses – most of them through NAPA – to build his knowledge of auto parts and accessories, tools and equipment and automotive technology. In 2015, Marra earned his ASE P2 Automobile Parts Specialist certification, and has completed the EPA-authorized ASE Refrigerant and Recycling Program. He says his next goal is to earn ASE P1 Medium-Heavy Truck Parts Specialist certification. Marra calls his ASE certification his “car diploma.” In addition to the knowledge that comes with passing the ASE P2 test, certification gives the 26-year-old credibility with his customers. “I always tell my shops, ‘Whatever we have to do to help you get that car off the lift, you name it,’” Marra says. Attending NAPA Autotech training classes with local shop owners and technicians has helped him strengthen the relationships with his installer customers. Previously, the nearest training location was a two-hour drive from New Canaan during rush hour, and Marra would offer to take his customers to and from the classes. When he convinced NAPA to move the classes closer to the New Canaan area, attendance from his customers doubled. Attending the classes together has paid dividends for the installers and Marra. Marra even took some of his installer customers on a tour of a NAPA distribution center. The trip left a lasting impression on those who attended. His dedication hasn’t gone unnoticed. 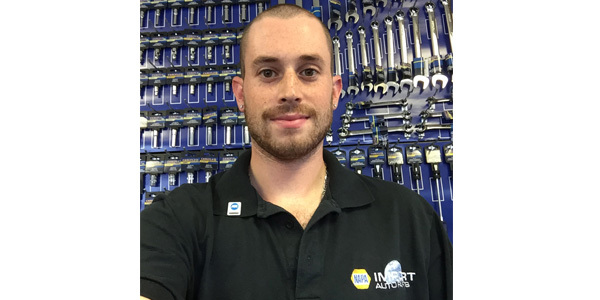 Marra has been the Connecticut NAPA/ASE Parts Specialist of the Year for the past two years, and he is the 2018 National NAPA/ASE Parts Specialist of the Year. He also was a finalist for Counterman’s 2018 Counter Professional of the Year. Marra is at his dad’s store six days a week, “no matter what’s going on.” Even though the store opens at 8 a.m., he’s there by 6 a.m., which gives him time to work on an online training course or polish the counter. In the early-morning hours, his installer customers might stop by to pick up their overnight orders too. Marra also has volunteered for various functions at his church and has been a basketball and baseball coach in local youth recreational leagues. But it’s safe to say that his first love is the auto parts business.